I haven’t reviewed any exercise gear in a while, but I have a new toy to share! There’s a lot of hype lately about “wearable technology,” especially with the upcoming release of the Apple Watch. Now, I’ll admit that the Apple Watch looks very cool, but it’s really out of my price range. However, I love gadgets, so I decided to spring for the new Fitbit Charge HR. 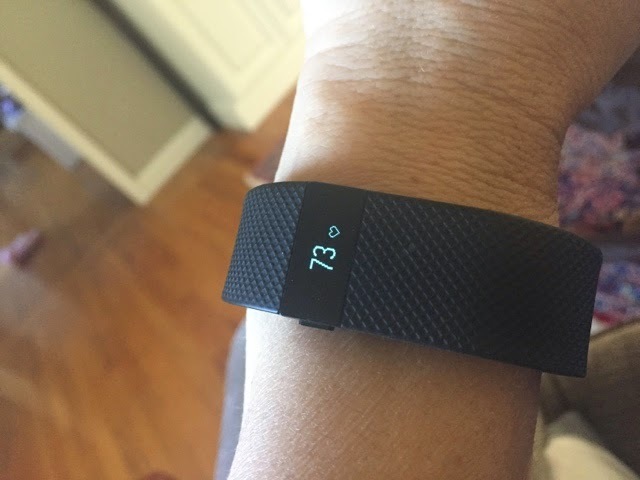 For those of you not familiar with the Fitbit, it’s sort of like a pedometer…but so much more. Yes, it counts your steps. It also estimates your calorie burn, miles walked, flights of stairs climbed, and active minutes per day. 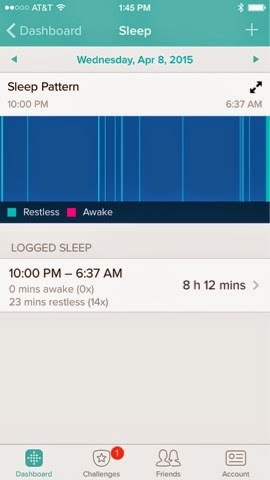 All of the information syncs with your phone or computer. You can “friend” people for some friendly competition. 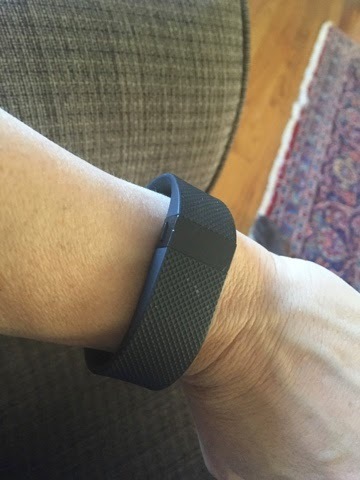 I used to have a Fitbit One, which you clip onto your clothes, like a traditional pedometer. However, when I heard about the Fitbit Charge HR, I knew that I had to have it…because of it’s new feature, a heart rate monitor. That’s not a picture of me. I wish. The chest strap is very accurate at transmitting the heart rate. There are, however, some significant drawbacks. First, the contact points need to be moistened to work. Once you’re sweating, you’re pretty much good to go, but until then you need to wet the transmitter. Which basically involves licking your fingers and sticking them up your shirt. This is occasionally an awkward thing to do. Next, once you’re sweating, the band can slip down a lot (at least it did on me). This can become pretty irritating. Speaking of irritating, you can also develop quite a bit of chafing after a long run. I actually have scars just below my breastbone from chafing from my heart rate monitor. 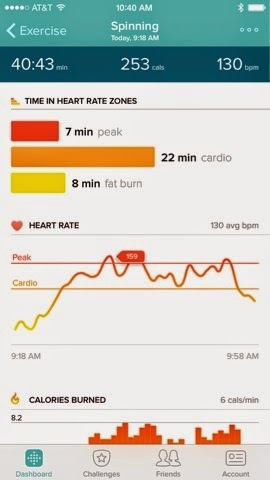 The heart rate monitor on the Charge HR works differently. 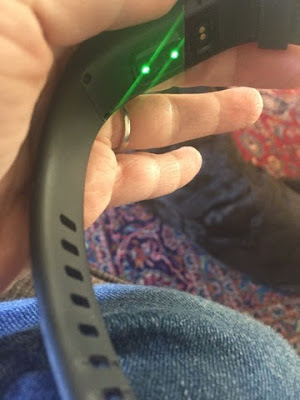 It’s an LED light that measures the blood flow in the capillaries below the skin (it works kind of like a pulse oximeter works at the doctor’s office). Therefore, you don’t need to have a direct skin contact point for it to work. The light is green, but I don’t find it to be noticeable unless I’m in a dark room and my wrist is flexed. Here’s what the lights look like- they’re on the underside of the watch. And see? You can’t see them while you’re wearing it. There’s a button on the side that you can press and the face will display the time, steps, calories, heart rate, and stairs climbed. You can also just tap on the face and get one of those displays to show up (mine shows heart rate). I’ve been pretty impressed with the accuracy of the monitor. I tested it against my chest strap and it did pretty well. The only spots where it had trouble was if my heart rate was changing really rapidly (like I was running really fast and then stopped to walk) and in my spin class where it sometimes had trouble reading the rate because of how my wrist was flexed against the handlebars. Fun! When you set up your account and put in your age, it’ll calculate out your heart rate zones. You can also manually set the zones. 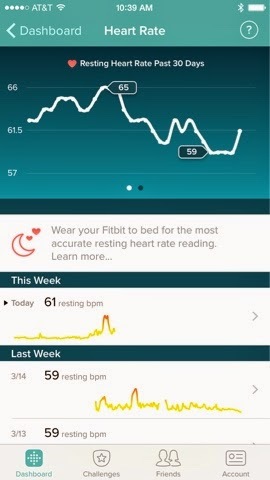 If you wear it to sleep, it’s great for seeing how your resting heart rate decreases as you get more fit. Speaking of wearing it to sleep, it’ll also tell you how well (or how badly) you’re sleeping at night. Bonus for its ability to set an alarm to wake you up with a buzz at your wrist. The Fitbit app also integrates seamlessly with MyFitnessPal, which is a terrific calorie tracker. Using the two apps together is a really powerful tool to help lose or maintain weight. The battery life is surprisingly long. I’ve gone 4 1/2 days without charging it, which is pretty impressive for something that is monitoring your heart rate 24 hours a day. Overall, two thumbs up. I’ve been really impressed and I’m having a lot of fun with this little gadget!